One of the challenges in treating pancreatic cancer has been catching a tumor at an early stage when it can be surgically removed. Recent studies have found that the disease sometimes begins in the pancreas in the form of a pre-malignant cyst, known as an Intraductal Papillary Mucinous Neoplasm (IPMN). Just like skin moles, IPMNs are capable of remaining harmless or developing into invasive cancer. The trouble is IPMNs are common and they turn up on nearly 50 percent of high-resolution CT or MRI scans. A team of Mayo Clinic researchers has collaborated with computer scientists at the University of Central Florida (UCF) on an artificial intelligence algorithm to help radiologists evaluate IPMNs, as well as early lung cancers. The study, published in Institute of Electrical and Electronics Engineers: Transactions on Medical Imaging, developed an AI platform that reads MRI scans of IPMNs and CT scans of lung tumors. “This computer-aided diagnosis tool may help radiologists catch early lesions that can become deadly tumors,” says Dr. Wallace, co-senior author of the study. As the field of AI-informed image-analysis takes off, the team has been the first to use the approach to address pancreatic cancer, particularly through IPMNs. The study was based on a series of MRI scans conducted at Mayo Clinic, in which the fate of the IPMNs was known through pathology results and patients’ medical follow-up. Instead of developing a computer program that looked for a pre-determined set of IPMN features, such as the size of the cyst and the presence of nodules, the team developed an algorithm designed to mimic the agility of a human brain, called a convolutional neural network. The algorithm itself was designed to ferret out relevant patterns in the scans, distinguishing high-risk and low-risk cysts. Pancreatic cysts can be found incidentally in up to 40 percent of scans performed for something else, says Mayo Clinic radiologist Candice Bolan, M.D., who was part of the team that developed this algorithm. They hoped that using this tool to supplement a radiologist’s interpretation could help bring attention to the cyst and hopefully help in evaluating whether it is high or low-risk. The team found the algorithm able to complement the best skills of an expert radiologist interpreting the highest quality MRI scans. Both are correct nearly 85 percent of the time about the dangerous potential of an IPMN cyst. 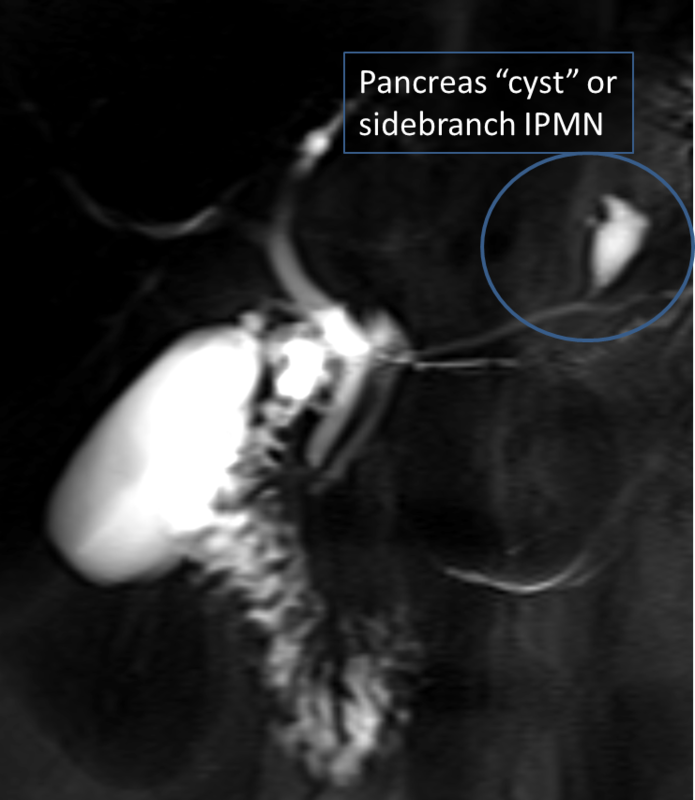 “Radiologists must read more than 1,200 MRI images from a single patient to evaluate a pancreatic cyst, and the algorithm can quickly red-flag areas that require another look, or green-flag something that has the features of a benign cyst,” Dr. Wallace says. Further, the tool may help provide expert-level skills throughout the field, standardizing the evaluation of IPMNs. The collaboration began as part of a pilot program aimed to bridge the unique skills of Mayo Clinic’s Florida campus and the University of Central Florida. “We had a gathering similar to the pace of a speed-dating session for researchers, and Dr. Bagci [of UCF] and I heard each others’ presentations and realized we had common research interests, particularly in medical imaging,” Dr. Wallace says. And for radiologists, says Dr. Bolan, AI presents a real opportunity. “AI may help to process large volume datasets more efficiently and enhance our interpretations, with the ultimate goal of providing the best patient care possible,” she says. “In this case, patients may be identified and stratified into the most appropriate management scheme.” The team’s next step will to be to heighten the accuracy of the algorithm through machine-learning, adding data through additional scans from registries at Columbia University and Erasmus University in the Netherlands. In addition to Drs. Bolan and Wallace, the Mayo Clinic research team included Pujan Kandel, M.D., along with Sarfaraz Hussein, Ph.D., and co-senior author Ulas Bagci, Ph.D., of the University of Central Florida.